DALLAS – A recent North Dakota State University study found that the average American household spends about 3.8 percent of their income on clothes. With children consistently growing out of shirts, pants and dresses or wanting the latest and greatest brands, keeping the kids attired can prove an expensive endeavor. Recognizing that investing in kids doesn’t have to break the bank, the Army & Air Force Exchange Service has unveiled new pricing for all Childrenswear with five simple price points: $5, $10, two for $15, $15 and $20. 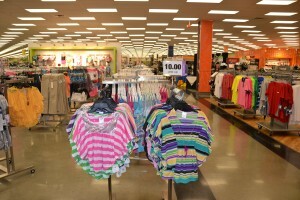 Styles included in the Exchange’s new Childrenswear pricing (excluding furnishings, accessories and jackets and coats) range from Exclusive Brands such as Buzz Cuts and Ponytails to nationally-recognized labels including Nautica, Union Bay, Levi’s and Skechers, among others. This entry was posted on Tuesday, May 22nd, 2012 at 16:32	and is filed under Press Release. You can follow any responses to this entry through the RSS 2.0 feed.